Yuen Woo-ping’s handling of this historically inaccurate, faintly moralistic film is at best chaotic and comic, and at its worst safe and sickly. Close combat nutcracker Yim Wing Chun (Michelle Yeoh) lives a quiet life with her boisterous auntie and an unfortunate runaway named Charmy (Catherine Hung Yan). The trio own a market stool selling soya bean curd which catches the eye of luring men folk like Waise Lee’s pervy nobleman Scholar Wong. But they also attract the diligent presence of travelling bumpkin and good-with-his-fists fighter Leung Pok-to (Donnie Yen). Pok-to and Wing Chun are revealed to have been childhood sweethearts, but they haven’t seen each other for years. Charmy is kidnapped by a bunch of kung fu bandits (for some reason) and Pok-to and Wing Chun fly in to help, reacquainting through a mixed-up comedy of errors. OK, so the real story of Yim Wing Chun and Leung Pok-to couldn’t be further from this (there is also hardly any genuine wing chun performed in the film), but don’t let minor quibbles like historical fact and stylistic integrity upstage the film’s abundance of charm. 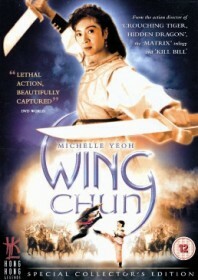 Yen’s comic performance contrasts brilliantly with Yeoh’s upstanding vision of Yim Wing Chun. She’s elegant and coy, but possesses an authority which storms the screen like a bull in a china shop. Studio: Sil-Metropole Organisation, Woo-ping Films Co.